The rise of the cryptocurrencies made market speculation available for masses as traders didn’t need brokers to invest anymore. A stable internet connection and an account on the cryptocurrency trading platform are now the only two things needed to start trading. There are a lot of centralized crypto trading sites battling for a piece of the market, but not all of them offer the same services to their clients. This article will cover four of the most notable trading platforms for cryptocurrency margin trading. So, basically, margin trading is another name for trading with borrowed funds. It enables traders to enhance their profits on successful trades as the amount invested can be substantially bigger than what they can realistically afford to trade with. The word “margin” refers to the amount of trader’s personal funds in his margin account (collateral). Naturally, the bigger the collateral, the more funds trader can borrow from the exchange to leverage. In cryptocurrency margin trading, investors can leverage 2:1 (2x), 3:1 (3x), 20:1 (20x), or even 100:1 (100x) ratio, depending on the platform and the amount of risk they are willing to take. But, obviously, margin trading is a very risky business, and the same way as it can generate hefty profits, it can engender serious losses for traders embarking on such an adventure. One of the well-known centralized cryptocurrency exchanges that are offering margin trading is definitely Bitfinex. Despite the fact that it suffered a major hackers’ attack in 2016, Bitfinex landed on its feet to remain among the top 50 global cryptocurrency trading platforms, with much-needed liquidity for swing and day trading derived from roughly $88 million of daily trading volume at the time of writing. Bitfinex margin trading rules state that every margin position has to have at least 30% of traders funds invested, which means that trader has to invest $100 of personal funds to be able to trade $333.33 on a margin. However, Bitfinex enables its users to select smaller leverage of 2:1. Considering the return rate, Bitfinex has a wide variety of percentages traders have to return to their lender. From a minimal 0.0004% for Bitcoin (BTC) to substantially higher 0.06% for US dollar (USD). Trading fees can also be considered minimal since they range from 0.0% to 0.2%. Bitfinex has fiat deposits and withdrawals enabled with zero-fee policy except for wire transfers, which provides more flexibility for traders who don’t have to use any other third party exchange service, while the user-friendly margin trading interface ensures that traders are always sure of what they are doing in any particular moment. In terms of the overall daily trading volume, Kraken doesn’t fall far behind Bitfinex with roughly $44 million worth of cryptocurrencies traded each day. The most liquid pair on the exchange is BTC/EUR with $14 million traded daily, which provides enough liquidity for a decent trading experience with the official currency of the European Union. US traders margin trading on Kraken will have a rather short deadline of only 20 days to close their positions, contrary to users from other countries who are given a full year to utilize their trading tactics and come away with a profit, which can be considered as a big disadvantage for their US clients. The exchange enables users to deposit and withdraw fiat currencies, however, those who wish to do so will be able to choose from the free of charge to $10 deposit fees, and from €0.09 to the astronomical €60 withdrawal fee for EUR bank wire withdrawal, depending on the place of origin, transfer channel used and currency that’s being transferred. Kraken differentiates maker’s and taker’s fees, but their range is similar to those on Bitfinex and varies from 0.0% to 0.026%, while the situation with margin trading interests is more complicated. Opening the trade will cost traders 0.01% or 0.02%, while interests are charged in the range from 0.01% to 0.02% for every 4 hours traders hold the position. Even compared to the previous two, BitMEX can be considered as a giant of the Bitcoin (BTC) trading industry with a current daily trading volume of roughly $700 million. Its business revolves around BTC derivatives contracts, margin trading among them, therefore, note that traders there don’t trade actual cryptocurrencies, but only contracts connected to their price. Traders using BitMEX are able to leverage their long and short bets from minimal 2:1 ratio to a stunning 100:1, which is as flexible as it gets. However, BitMEX is by no means a simple trading platform. Fees are based on a rather complicates equation, which is envisioned to provide the most realistic percentage in accordance with all the parameters while trading long and short positions. The exchange also differentiates market makers and takers, so makers will be subjected to traders’ fees in the range from 0.025% to 0.05%. On the other hand, takers will have to pay from 0.075% to 0.25% for their trades. Nevertheless, the potential profit from a margin trading contract generated on BitMEX will be paid out in Bitcoin since all contracts are BTC-related. 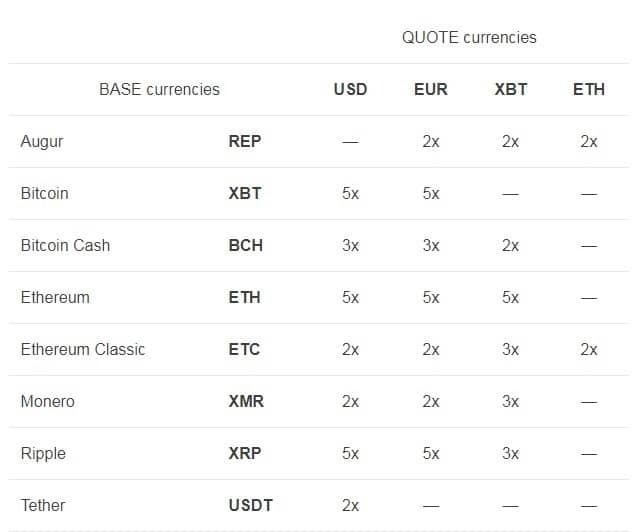 Since BitMEX is Bitcoin-based trading platform exclusively, traders are not able to deposit fiat currencies. However, the exchange doesn’t charge deposit fees, and when withdrawing their money, users are only obligated to pay for a regular BTC transaction fee, which can get very high in times of the network congestion. To be exact, BitMEX is definitely a professional trader’s tool, and we do not recommend it for those less experienced traders looking to find their way in margin trading. One has to be very familiar with the terminology and trading systems to utilize all aspects of this trading platform and not get lost in its many advanced features. If you are interested to learn more about Where to Trade Cryptocurrency Derivatives, we have an in-depth article available on our blog too. With the daily trading volume of $200 million at the time of writing, Huobi is a giant of the cryptocurrency trading industry, providing enough liquidity for a great trading experience. Huobi pro differentiates two daily interest rates. Traders borrowing Tether (USDT) will have to repay 0.1% more on daily basis, while other cryptocurrencies included will generate daily interests of 0.2% for the exchange, while traders are allowed to use the leverage of up to 3:1. Furthermore, all traders, be they market makers or takers, will have to pay a flat 0.2% traders fee. Since the exchange has been driven out of China by the restrictive regulations, there are no fiat deposits and withdrawals possible on Huobi. However, cryptocurrency deposits and withdrawals are free of charge. We can say that Huobi is a very simple trading platform, with the interface suitable even for those less experienced in cryptocurrency trading. Huobi claims to be available for clients in 130 countries around the world, with a special platform for US citizens. As it is obvious, all four trading platforms are different when it comes to cryptocurrency margin trading. Each of these cryptocurrency exchanges has its pros and cons, depending on what traders need the platform to do, so it is up to each individual user to decide which one suits his needs best. While Bitfinex offers the best jurisdictional coverage and the most trading pairs, BitMEX offers a state-of-the-art professional interface and the highest leverage. On the other hand, Kraken provides yet unbreached security system. Huobi can be viewed as a balance of all things mentioned. In the end, we have to disclose that we may have not mentioned some trading sites which can be considered as the top 10 margin trading services, like eToro or HitBTC. Still, this is a brief overview of just some of the most used, not the margin trading encyclopedia. Before you start leveraging your bets, do your due diligence and explore other options.